Posted on November 14, 2013 by Dawn Castel. Maison Castel's two tone high low Linen Dress fits well with Ante London's Leather Transform bag, an oversize bag that converts to a backpack. Posted on November 13, 2013 by Dawn Castel and tagged Ante London. 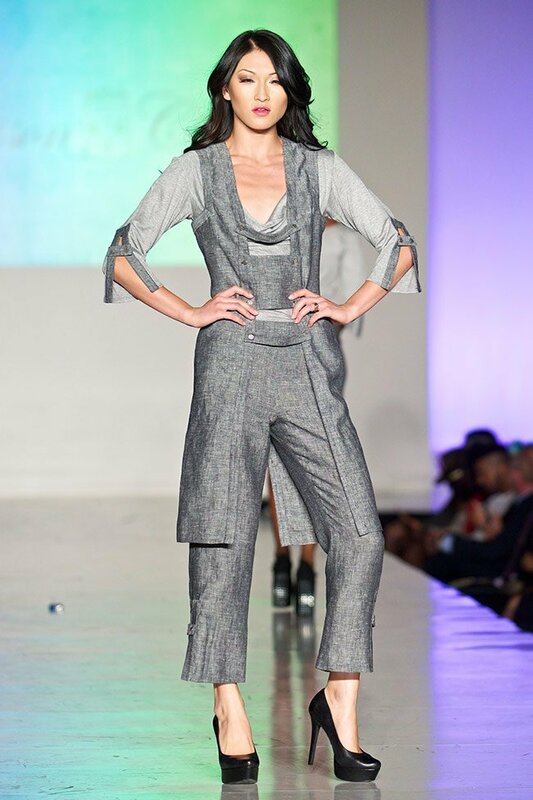 Maison Castel debuted its Spring 2014 collection to a sold out audience at the "All Aboard" Annual Runway Show during LA Fashion week. Posted on November 13, 2013 by Dawn Castel. Necklace from CInderella's Sea Collection "Night and Day"
Three pieces of the Maison Castel Collection were selected for the WWDMagic runway show. The Origami dress (shown below) was well received by the audience. Posted on November 3, 2013 by Dawn Castel. Maison Castel has been chosen to participate in the WWDMAGIC Emerging Designer Showcase. The show will be August 19, 20 and 21, 2013 at the Las Vegas Convention Center, South Hall, Level 2. We look forward to seeing you there. Posted on July 13, 2013 by Dawn Castel. On Sunday April 14th, Dawn's discarded to Divine dress was featured in the San Francisco Chronicle's Style Section. "As the evening came to an end , volunteer models donned the coveted items for an impromptu live auction. The "Versailles" embellished coat by designer Olga Shor, went for $460, and "Gurl with a Purl" a wool trapeze jacket, by Moda Gwendolina, was sold for $600. The ornate dress "Fleur Bleues" by Dawn Castel, was the belle of the ball, and sold for $900." SFUNZIPPED, May 15-22, Discarded to DIvine: A simple way to help. On Friday, April 12th, 2013, Dawn Castel's "Fleurs Bleues" submission won the prestigious Best Garment Award at San Francisco's de Young Museum Discarded to Divine premiere. Posted on May 19, 2013 by Dawn Castel. Our first delivery from our Bay area manufacturer. Wow! now we can start selling and delivering to our customers our high quality garments. Every day, more than 1000 San Franciscans who struggle with homelessness, poverty, addition and domestic violence turn to the St. Vincent de Paul Society of San Francisco for help-and-hope. Every year leading and aspiring designers transform the discarded textiles into fashionable clothes, jewelery and home decor. THe auction which raises $50,000 to $100,000 plus is preceded by a preview at the De Young Museum. Take a look at some of Dawn's reclaimed fashion submissions or visit www.discardedtodivine.org for a full viewing of the amazing submissions.